Why Is Having High Cholesterol Bad? Cholesterol is an essential substance found in every animal cell. It can be either our friend or our enemy, depending on how much of each type is carried. The waxy, fat-like substance does not mix in blood and is transported by lipoproteins, where it goes to many areas of the body. Cholesterol is an essential substance found in every animal cell. It can be either our friend or our enemy, depending on how much of each type is carried. The waxy, fat-like substance does not mix in blood and is transported by lipoproteins, where it goes to many areas of the body. This can have a positive or negative effect, depending on where it is transported to. Low-density lipoproteins carry cholesterol to the artery walls and harden them, causing serious health problems such as a heart attack or stroke. High-density lipoproteins, on the other hand, can remove fat from the artery walls. 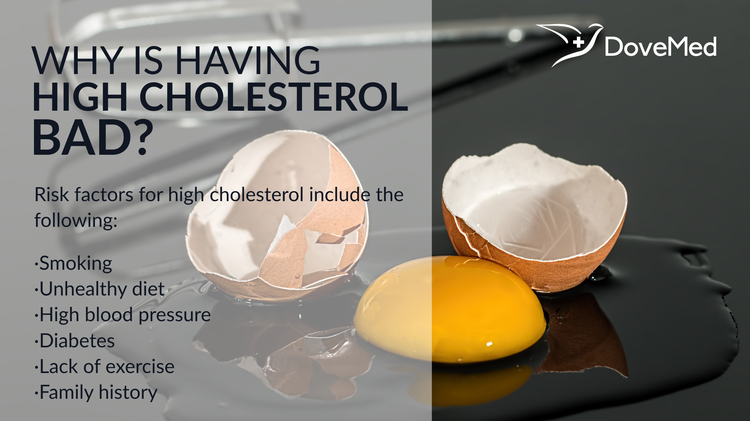 Cholesterol is vital for many biological functions. It contributes to the structure of the membrane of cells. Cholesterol is an important component for digestive bile acids in the intestine. It also allows us to make certain hormones including progesterone, estrogen, and testosterone. Smoking – damaging the blood vessel walls and making fat accumulation easier. Unhealthy diet – eating foods high in cholesterol like red meat and fatty dairy products. Also, taking saturated fats and trans fats have been found to raise your cholesterol levels. High blood pressure – high blood pressure damages the artery walls, making fat accumulate much faster. Diabetes – high blood sugar increases LDL cholesterol and decreases HDL cholesterol. Lack of exercise – exercise helps the body increase high-density lipoprotein levels and lower the low-density lipoproteins. Family history – a family history of heart disease can place an individual at greater risk. High cholesterol is also called hypercholesterolemia, which is an important risk factor for coronary heart disease, which is the cause of heart attacks. A reduction in high blood cholesterol levels lowers one's risk for heart disease. High levels of low-density lipoprotein can lead to an increase of cholesterol in the arteries. On the contrary, high-density lipoprotein carries cholesterol to the liver for removal from the body. A build-up of cholesterol in the blood vessels can lead to narrowing of the arteries, called atherosclerosis, in which plaques are formed on the arterial walls and a restriction of blood flow persists. If there is a clot in a coronary artery, the heart will not get enough oxygen. Without enough oxygen, the heart becomes weak and damaged, leading to a heart attack. Hence, it is always good to limit your intake of foods that are high in cholesterol, saturated fats, and trans fats and opt for a low cholesterol diet. You should also aim to eat more raw vegetables and less fried and processed foods. If you are concerned about your cholesterol levels, talk to your healthcare provider or dietician about how to lower cholesterol in a safe way that is best for your body. Heart Protection Study Collaborative Group. (2002). MRC/BHF Heart Protection Study of cholesterol lowering with simvastatin in 20 536 high-risk individuals: a randomised placebocontrolled trial. The Lancet, 360(9326), 7-22. Heart Protection Study Collaborative Group. (2004). Effects of cholesterol-lowering with simvastatin on stroke and other major vascular events in 20 536 people with cerebrovascular disease or other high-risk conditions. The Lancet, 363(9411), 757-767. Ballantyne, C. M., Olsson, A. G., Cook, T. J., Mercuri, M. F., Pedersen, T. R., & Kjekshus, J. (2001). Influence of low high-density lipoprotein cholesterol and elevated triglyceride on coronary heart disease events and response to simvastatin therapy in 4S. Circulation, 104(25), 3046-3051. Expert Panel on Detection, E. (2001). Executive summary of the Third Report of the National Cholesterol Education Program (NCEP) expert panel on detection, evaluation, and treatment of high blood cholesterol in adults (Adult Treatment Panel III). Jama, 285(19), 2486. Ridker, P. M., & JUPITER Study Group. (2003). Rosuvastatin in the primary prevention of cardiovascular disease among patients with low levels of low-density lipoprotein cholesterol and elevated high-sensitivity C-reactive protein rationale and design of the JUPITER trial. Circulation, 108(19), 2292-2297.